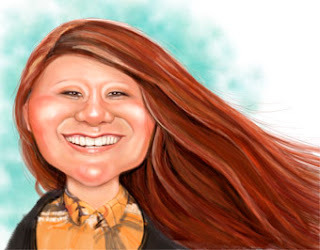 This is a caricature I did of Shiori Sato one of fellow artists at the NCN convention in Tokyo. Always happy, always smiling - I just couldn't understand a word she said - I really should have read ( ..and practiced ) the Japanese phrase book more. Photoshop CS3 from a rough pencil sketch.